The Hala'ib Triangle is a disputed area claimed by both Sudan and Egypt. The Abyei Area is a disputed area claimed by both Sudan and South Sudan. The Ilemi Triangle is a disputed area claimed by both South Sudan and Kenya. Where are Sudan and South Sudan? Sudan is located in northeastern Africa. Sudan is bordered by the Red Sea, Egypt and Libya to the north, Chad and Central African Republic to the west, South Sudan to the south, and Ethiopia and Eritrea to the east. South Sudan is located in northeastern Africa. South Sudan is bordered by Sudan to the north, Central African Republic to the west, Democratic Republic of the Congo, Uganda, and Kenya to the south, and Ethiopia to the east. Google Earth is a free program from Google that allows you to explore satellite images showing the cities and landscapes of Sudan, South Sudan, and all of Africa in fantastic detail. It works on your desktop computer, tablet, or mobile phone. The images in many areas are detailed enough that you can see houses, vehicles and even people on a city street. Google Earth is free and easy-to-use. Sudan and South Sudan are two of nearly 200 countries illustrated on our Blue Ocean Laminated Map of the World. This map shows a combination of political and physical features. It includes country boundaries, major cities, major mountains in shaded relief, ocean depth in blue color gradient, along with many other features. This is a great map for students, schools, offices and anywhere that a nice map of the world is needed for education, display or decor. 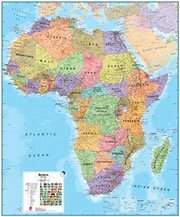 If you are interested in Sudan, South Sudan, and the geography of Africa, our large laminated map of Africa might be just what you need. 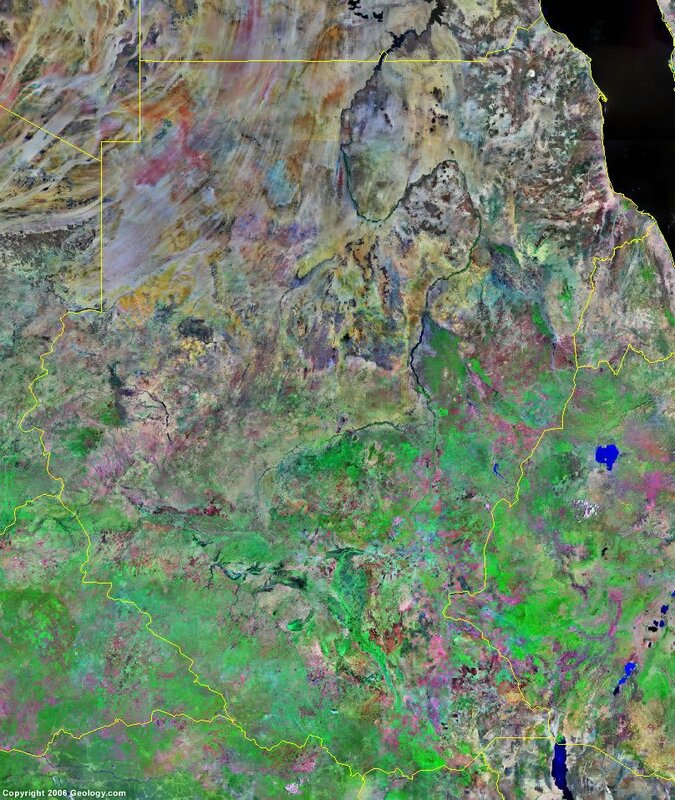 It is a large political map of Africa that also shows many of the continent's physical features in color or shaded relief. Major lakes, rivers,cities, roads, country boundaries, coastlines and surrounding islands are all shown on the map. Atbara, Berber, Dilling, Dongola, Ed Damazin, Ed Damer, Ed Dueim, El Fashir, El Fula, El Hawata, El Lagowa, El Manaqil, El Obeid, El Odaiya, En Nahud, Gedaref, Geneina, Kadugli, Karima, Kassala, Khartoum, Kosti, Kutum, Muglad, Nyala, Omdurman, Port Sudan, Rufa'a, Sennar, Shendi, Singa, Suakin, Umm Ruwaba, Wad Medani, and Wadi Halfa'. Aweil, Bentiu, Boma, Bor, Juba, Kapoeta, Kodok, Kuacjok, Malakal, Maridi, Mongalla, Raga, Rumbek, Tonj, Torit, Wau, and Yambio. Al Abyad Lake, Blue Nile, Dungunab Bay, El Bahr el Abyad (White Nile), Lake Kundi, Lake Nasser, Libyan Desert, Nubian Desert, and the Red Sea. Akobo River, Al Abyad Lake, El Bahr el Abyad (White Nile), Lake No, Mountain Nile, and Sobat River. The fuel resources in Sudan and South Sudan include petroleum and hydropower. Some of the mineral resources present are copper, chromium ore, tungsten, mica, silver, gold, zinc, and small reserves of iron ore.
Sudan and South Sudan are subject to periodic persistent droughts. Other natural hazards include dust storms. Environmental issues include inadequate supplies of potable water in addition to periodic persistent droughts. Land issues include soil erosion and desertification. The countries' wildlife populations are threatened by excessive hunting.